So here is the start to the series. My top 10 decorating tips and tricks that I use in my house and while decorating other people's houses. This is more geared towards if you are just starting to decorate or if you want to change the place up a lot...or just need something different :) And by all means, these aren't the rules and laws of decorating, you can have a beautiful space without doing a lick of these; this is just to get an idea of what to do to start. 1. Clean Slate. When starting to decorate a room or a house, I move everything out, even the heavy stuff. Start by bringing in only the things that you need and that will help the space with its ‘use’. Moving out the furniture allows your mind to envision new furniture patterns throughout the room and focus on what is truly needed. 2. Define the needs of the room. Defining the needs of the room allows you to move out anything that does not fit these needs and that may just get in the way and create clutter. 3. Clear out the clutter. Clutter just makes a cramped space feel more cramped and does not please the eye. 4. Bigger is Better. A few large pieces of furniture is always more appealing than a lot of smaller pieces (this goes back to clear out the clutter). 5. Invest in Substantial Pieces. Spend your money on pieces that will last a lifetime, like a couch. But make sure it is versatile, as seasons change and your tastes change, your decorating will also change. Having a neutral couch will help accommodate these changes. 6. Bring in Pattern and Texture. Keeping your main fixture furniture neutral will allow you to bring in pattern and texture in other ways. Bring in pattern and texture through accent pillows, rugs, accessories, and window treatments. 7. Rearrange your furniture. This rule applies to every room in the house. It’s an easy free way to get a new look in a room. Try to orient the largest piece towards a focal point of the room and build the other furniture around it. 8. Let the Light in. Light always makes a room appear bigger than it is, either through natural light or artificial lighting. 9. Hang window treatments high and wide. No matter how wide or narrow your window is, it is best to hang the treatments as high as the ceiling and even wider than the windows. This gives the illusion that the room is taller than it really is and that the window is wider than it really is making for a more substantial space. If you have an extremely wide window, consider breaking it up by placing a curtain panel in the middle. 10. Pull furniture in. It is not a rule that your couch has to be against the wall. Pull the furniture off the wall and float it on an area rug in the middle of the room along with other accompanying pieces. Create conversation areas. Doing so will create a cozier conversation area for your family and guests to enjoy. These are great tips, Alicia! Pinning now! I love getting decorating ideas but this post really helps me focus on what will really make the biggest difference. 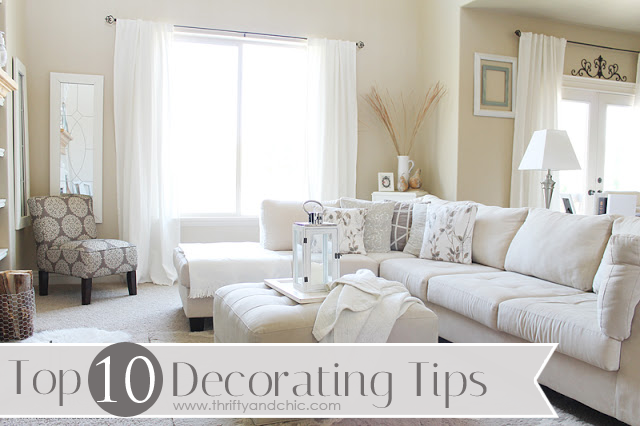 I love your decorating style so these tips must be working for you. Glad I hopped over from Link Party Palooza! This is a great summary for starting a new room! This is a great source of decorating tips. I really love to decorate the house, move the furnitures, give the house an entirely different look from time to time. These tips are really going to help individuals like me who love to decorate the look of the house and who furnitures and decorations. Your room is beautiful and love your quick cleaning tips! I do these a lot! Beautiful room. could you tell me the color and brand of the paint in the above photo? Thanks ! !